I made this recipe as an entry for CONTEST “Castagne al Desco”, organized by La Cucina Italiana and Il Desco. Chestnuts more than other fruits take me back to my childhood and a vanished world when things were more simple, a time that would be nice to rediscover. My family was composed of many people and the winters were long and cold requiring something good and hot to munch on during the evenings by the fire. At the end of October a man always passed by with a cart pulled by a horse with a few bags of chestnuts. He exchanged them with sacks of corn that my family produced. It was a fair bargain that left everyone satisfied and bound the plains with the mountains. Chestnuts were spread out in the barn and every afternoon my grandmother gathered enough for the evening, patiently cut each nut with small curved knife to prevent the roasted chestnuts from exploding. While she was cutting the chestnuts, she never got tired of telling me how important it was to do so. This time was spiced with stories of people who didn’t do so and lost an eye or other horrific incidents. The chestnuts were cooked on my Uncle Luigi’s wooden stove since he was recognized as the expert in this area. The roasted chestnuts gave off a nice smell that wafted in and out of the house. 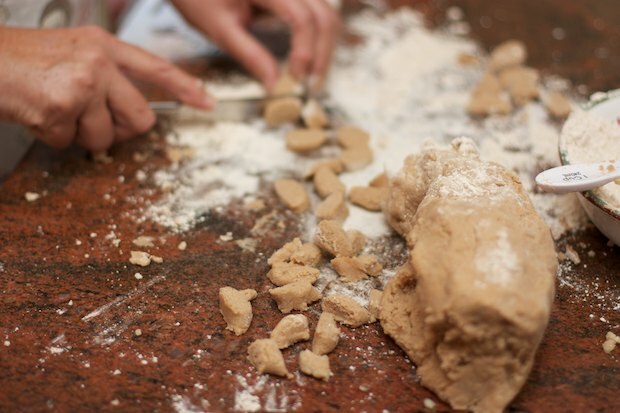 When my daughter-in-law, Colleen, informed me that the Province of Lucca in collaboration with “La Cucina Italiana” magazine was organizing a contest for the use of chestnut flour, I immediately enrolled. 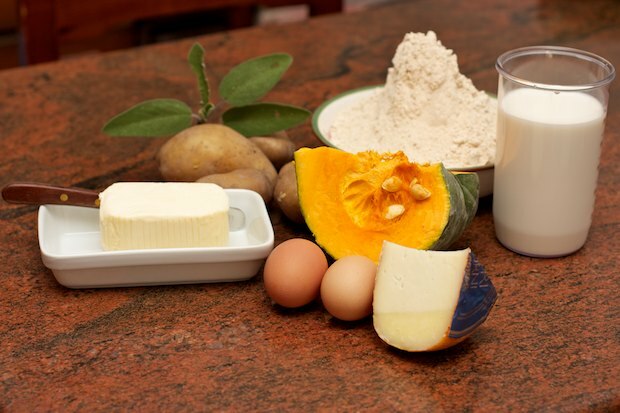 I planned on making a recipe where the chestnut flour replaced wheat flour, adding value the gnocchi, a dish usually prepared in many Italian homes. Thoroughly wash the potatoes with the skin on and put them in a pot with enough cold water to cover them. Bring to a boil and cook for 30 minutes. Check with a fork if the potatoes are cooked and if necessary continue cooking for a few minutes. Turn off the heat, drain the potatoes, and let them cool. Cut the pumpkin into small cubes. Place them in a saucepan with milk and sage. Boil for about 10 minutes. Remove the pumpkin cubes with a slotted spoon and keep them warm in a covered bowl. 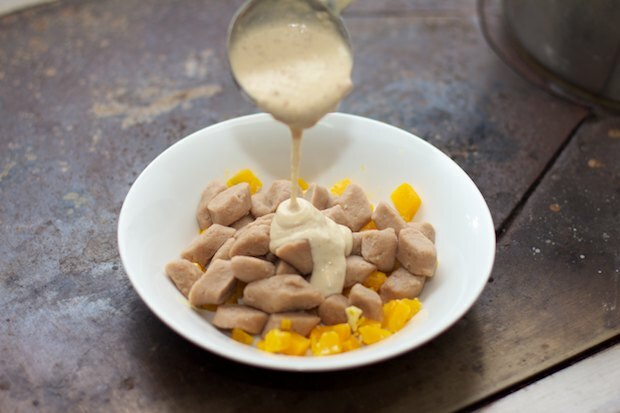 In a small bowl to work 1 cup of chestnut flour with the butter until the flour is incorporated. 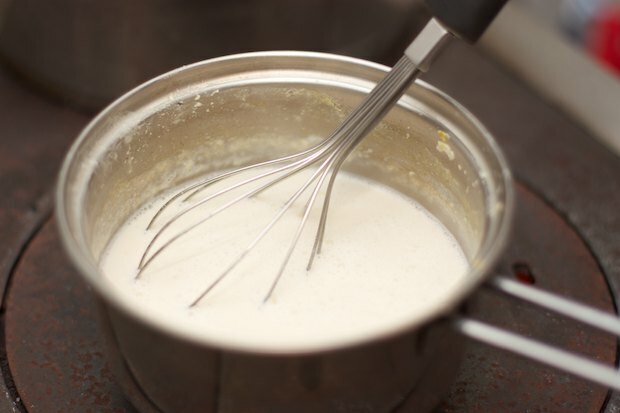 Reheat the milk that the pumpkin was cooked in and bring to a boil, then add the ball of butter, mixing thoroughly with a whisk until the sauce thickens. Keep warm without letting it boil (otherwise it hardens too much), add the parmesan cheese, nutmeg, a little pepper, and if you want, a little salt. In a pot, boil 3 quarts of water and a tablespoon of course sea salt. Peel and mash the potatoes with a potato ricer into a large bowl. 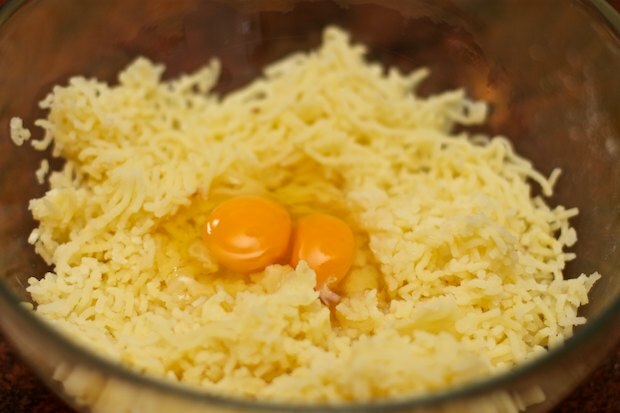 Add eggs and flour, mixing the ingredients with your hands quickly. 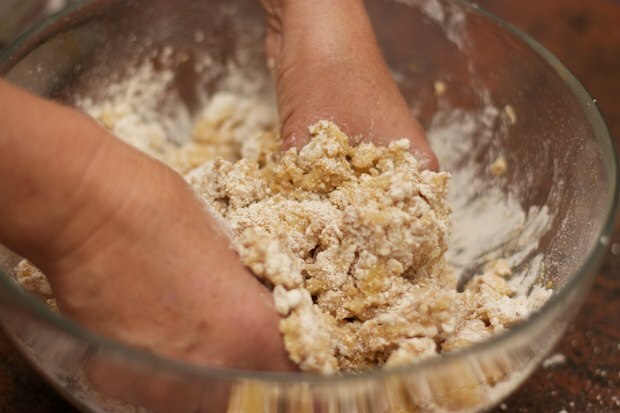 If the dough is too sticky, slowly add more flour a little at a time. 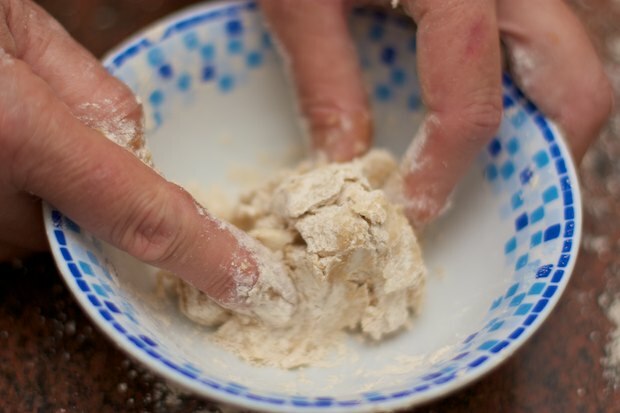 Flour a flat surface with chestnut flour, form rolls, then cut them with a small knife. 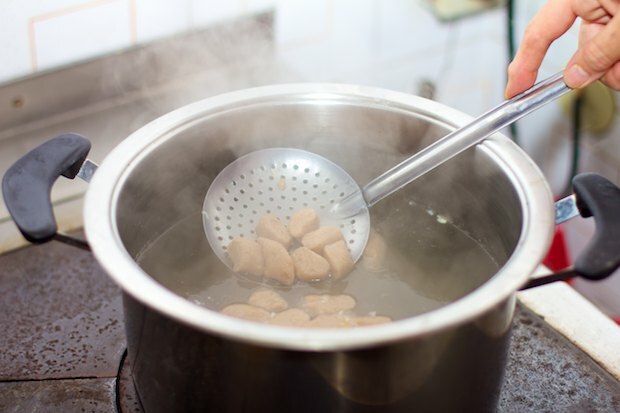 When the water boils, pour a third of the gnocchi into the pot and when they rise to the surface, remove them with a slotted spoon and put them in a bowl on top a hot water bath and cover. Proceed until all the gnocchi are cooked. 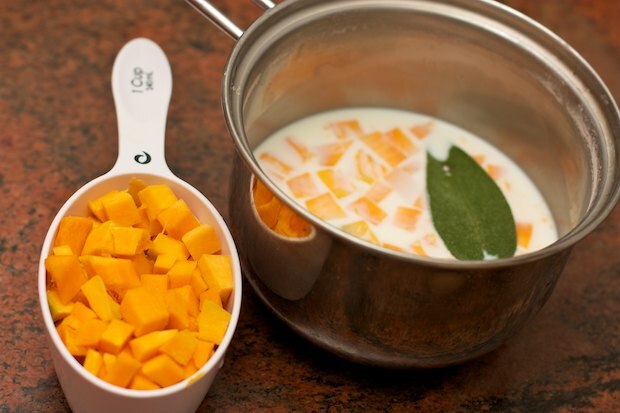 Place a portion of the diced pumpkin into each dish and over the pumpkin, add the gnocchi and ladle some sauce. 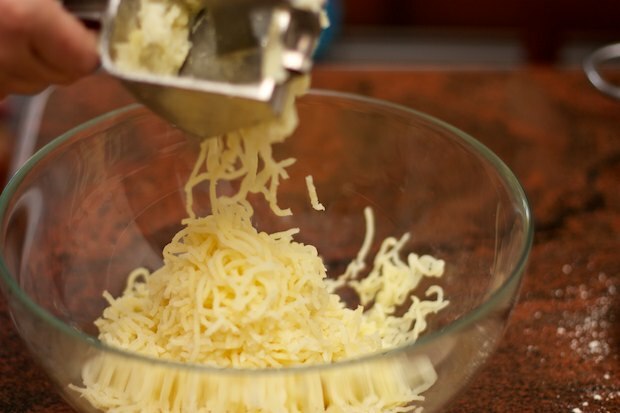 Garnish with slivered pecorino cheese. Serve piping hot. 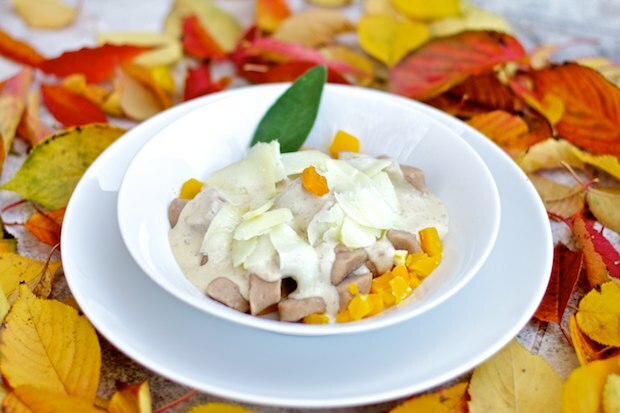 Posted in Pasta and tagged with Castagne al Desco Contest, Chestnut Gnocchi with Autumn Sauce, Gnocchi di Castagne con Salsa Autunnale, La Cucina Italiana. RSS 2.0 feed. cara daniela, sono LA MIGLIORE amica d tua sorella. che piacere ritrovarti e leggerti in qst splendida iniziativa. ieri, domenica ho ricopiato i tuoi gnocchi, ma senza zucca! un buon ragu’ in sostituzione. sono risultati buoni, piu, rustici e allo stesso tempo piu, gradevoli dei soliti gnocchi d patate. 6 grande. so tramite flavia che 6 attiva su tanti fronti….a distanza, ma t voglio bene. essendo io una cenerentola, m non quella della mezza notte, ti saluto xchè il mio primo piano mi aspetta. con grande gioia mi spalmerò sul materasso, con il calore grande del mio piccolo bassotto d nome Sigfrido! w la vita, sempre. Sono contenta che l’esperimento delle castagne sia riuscito.La versione con ragù di carne è interessante sopratutto per chi desidera un piatto più corposo.